I watched one of your television shows where the family of a hybrid trailer needed a stronger battery. You replaced their 12-volt battery with two 6-volt batteries. I have a 26-foot RV and it has only one 12-volt battery. Would it be better for me to use two 6-volts? Would I get more amps with two, 12-volt batteries instead? I also have a converter but no inverter in my trailer. If I pull into a campground or parking lot where I need to run off battery, the lights work but the outlets do not. How would I install an inverter into my trailer and how hard would it be? John, to replace your battery depends on the size (capacity) you have now. 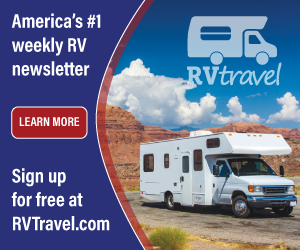 On RV Roadtrips, I replaced a group 27, 12-volt battery with two, 6-volt batteries. In that case the single group 27 was rated at about 105 amps. The two 6-volt batteries were rated at 225 amps. So even by adding a second group 27 battery, (105 + 105 = 210 amps), the two 6-volts in series had the larger storage capability. Plus they were true deep cycle batteries which is my preference. So it comes down to a matter of doing the math. And that starts by determining the size and rating of your existing battery. As for your interior receptacles, they are 120-volt AC only. All the lamps are 12-volt DC powered. For the receptacles to be usable, you'll need either a generator or an inverter. 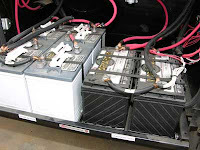 An inverter, however, requires a very large battery bank which will quickly be drained by using high current devices such as a powerful inverter. Inverters are relatively easy to install; no problem for the average handyman. Just be sure you have enough battery power. Batteries, generators, and inverters all should be "sized" according to the application. Sizing charts are easily found on the Web. I would suggest a small, true sine-wave inverter wired to a dedicated receptacle in order to conserve battery power rather than a larger unit to power every circuit.